The Muskogee is an upright, vase shaped crape myrtle growing in the 20 foot height range. 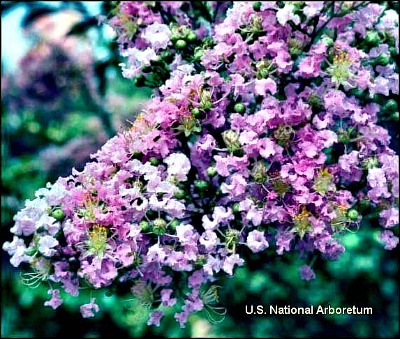 Developed by the National Arboretum in Washington, DC, the Muskogee Crape Myrtle presents showy lavender flowers from about mid summer to early fall. Fall foliage is red-orange. A small flowering tree for full sun. Muskogee crape myrtle is grown in a one gallon container. Orders shipping to CA and AZ addresses will be bare rooted and root washed before being prepped for shipping.